A lovely home on the west side of Harper! 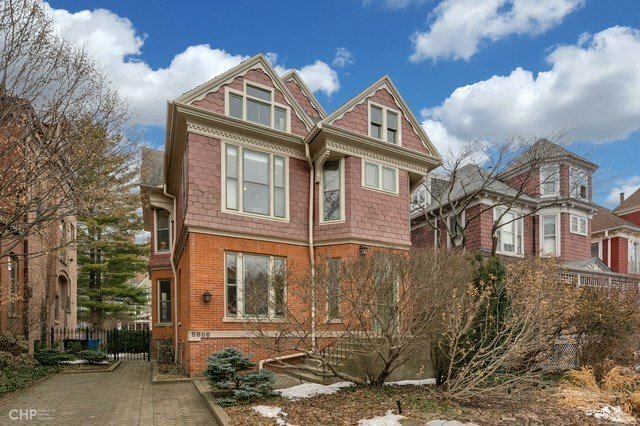 Highly updated brick-and-slate Victorian home is perfectly situated on one of Hyde Park's most popular and charming blocks. Sunny 4 bedroom, 3.5 bath house has an abundance of historic vintage detail + many modern upgrades, including central A/C, & upgraded electric and plumbing (incl new water line from the street). Beautiful open kitchen with lots of storage, hardwood cabinets, granite counters, upgraded appliances, & a huge island with seating for 4. Three good-sized bedrooms and 2 baths on the 2nd floor. A 4th bedroom and extensive storage on the 3rd. Basement has a fully-finished comfy family room, with built-in cabinetry (incl a king-sized Murphy bed), a full bath, workshop, & laundry room. Spacious deck off the kitchen overlooks a beautifully-planted backyard. Two parking spaces on the brick-paved side drive. Ray School district. Short walk to downtown transportation, shops on 57th St, U of Chicago campus, and both Lab School locations.